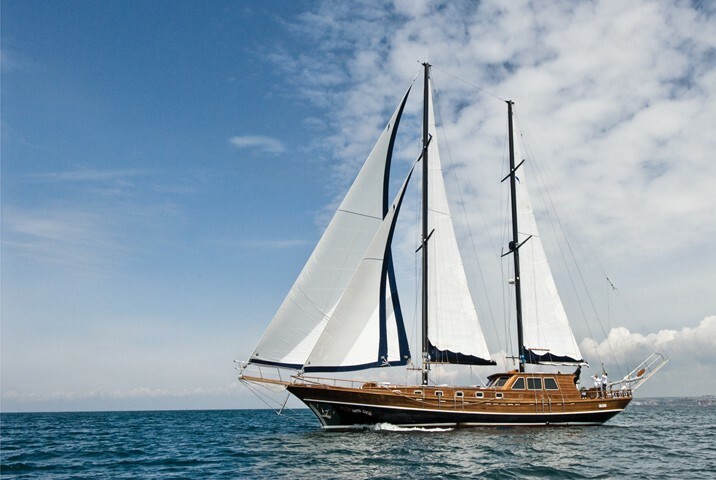 Luxury sailing yacht SANTA LUCIA was built in Bodrum Turkey in 2006, she measures 26m (85ft) and can accommodate up to 8 guests in 4 en-suite elegant cabins. 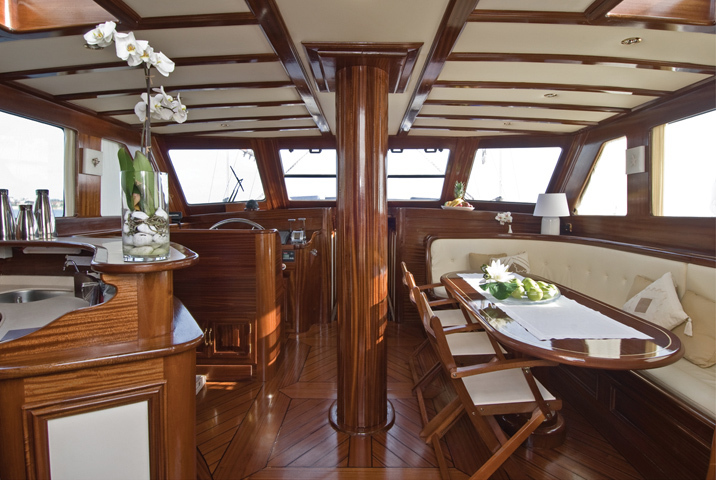 Charter yacht SANTA LUCIA is available in the west Mediterranean based in Italy, she is available for longer charters in the East Mediterranean. 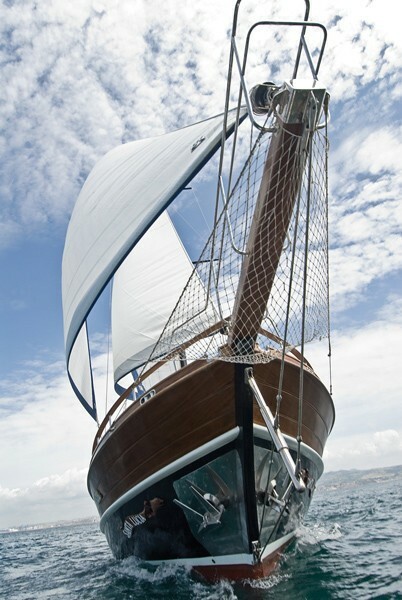 Sailing yachts SANTA LUCIA is a ketch rigged Gulet design constructed fully of mahogany and teak, offering ample interior and exterior spaces. The salon is light and airy in a raised cabin house, allowing plenty of natural light and scenic views. 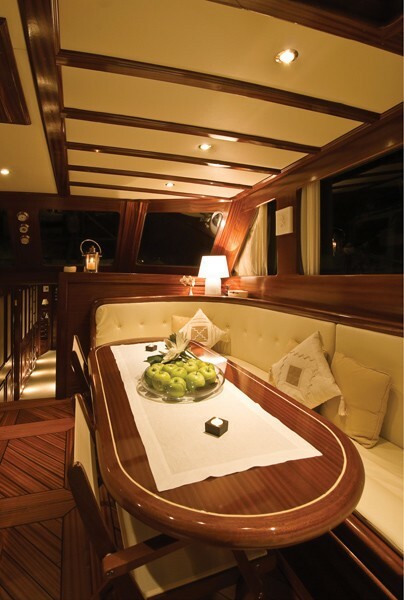 On the starboard side a formal dining space and U shaped sofa enable guests to dine and lounge in comfort .On the port side a wet bar/service area is ideal for an evening aperitif. 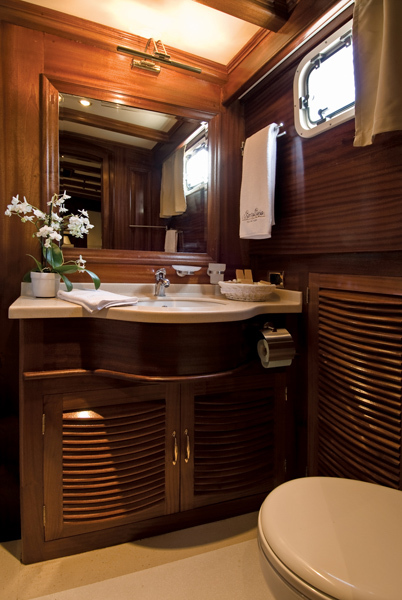 All guest cabins are forward of the salon. 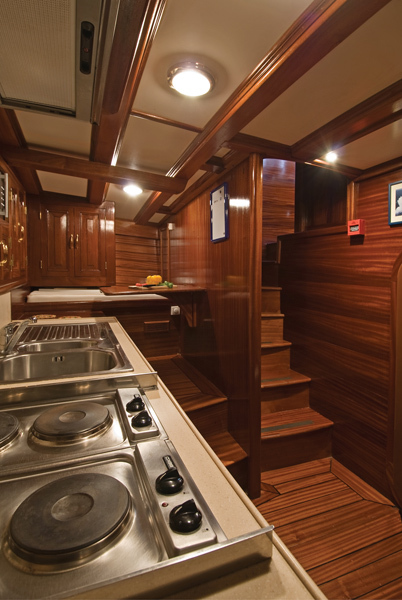 Motor sailor SANTA LUCIA features fabulous open deck spaces to enjoy. 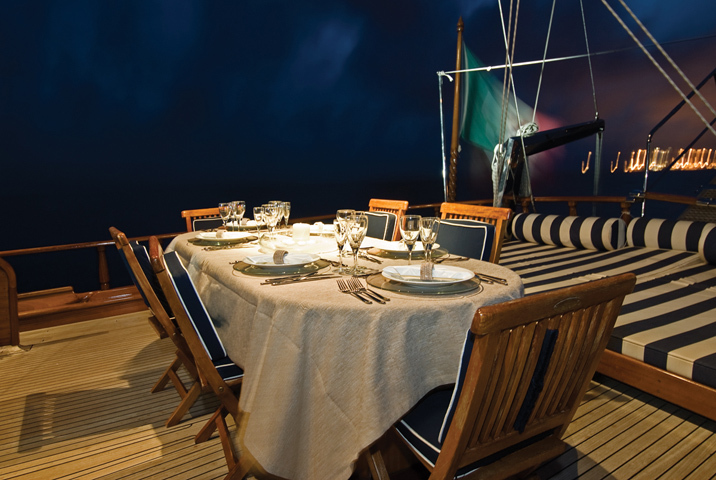 The aft deck is large with an alfresco dining option, full beam sunpad aft and optional shade from a Bimini cover. 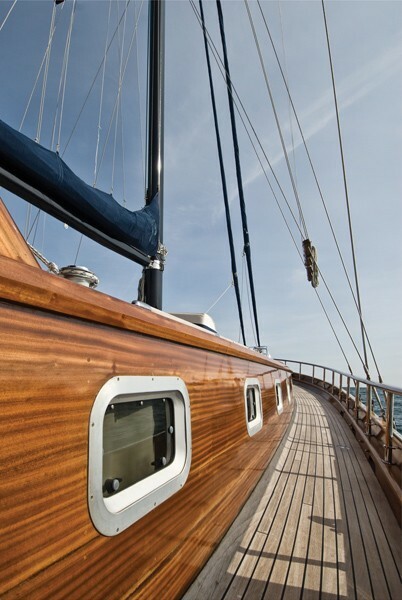 Side decks lead to the ample foredeck allowing ease of access to the forward seating area. 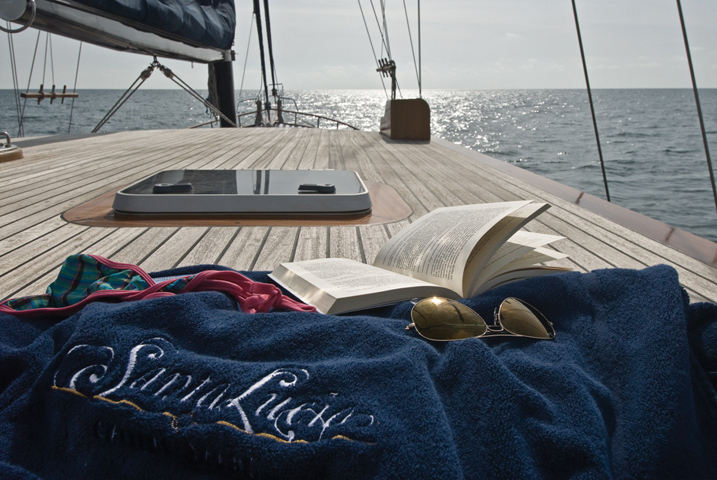 M/S SANTA LUCIA boasts plenty of sunpads on the forward cabin house, perfect for sunning, relaxing and watching the vistas go by. 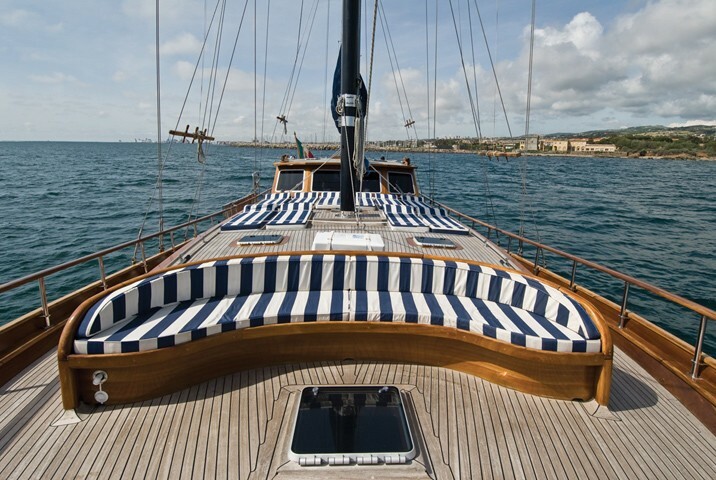 Charter yacht SANTA LUCIA has a wide fold out boarding ladder with swim platform. 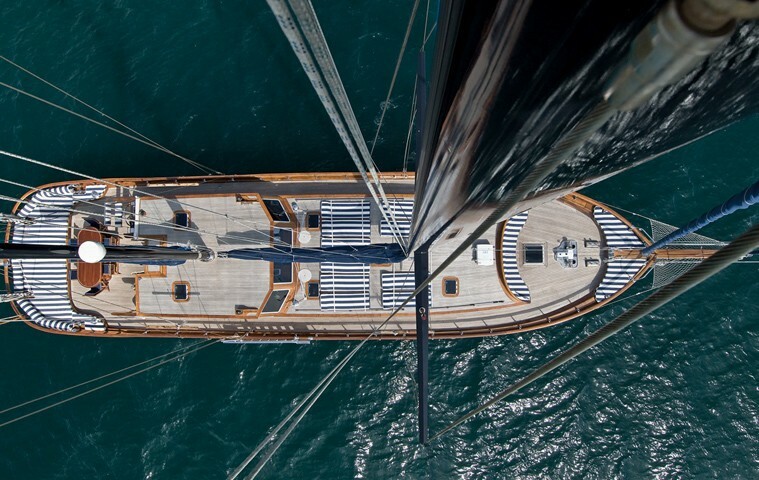 Charter yacht SANTA LUCIA has a beam of 6.3m (20ft) and a draft of 2.9m (9.8ft), she is powered by 2 x MAN 340hp engines and is capable of 10 – 14 knots. 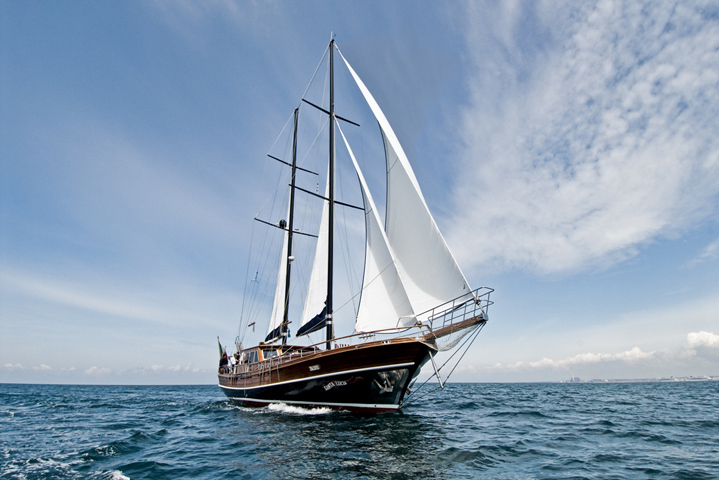 Luxury Gulet SANTA LUCIA offers 4 en-suite cabins for up to 8 guests. 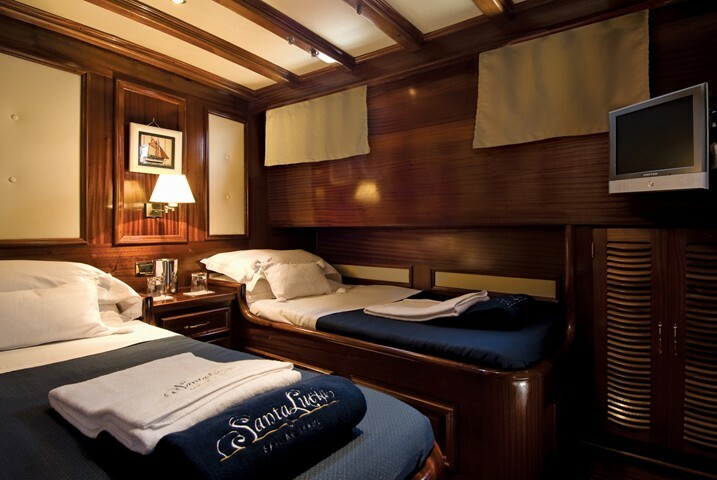 Forward of the salon on port and starboard are 2 mirror image cabins with twin side by side single beds. 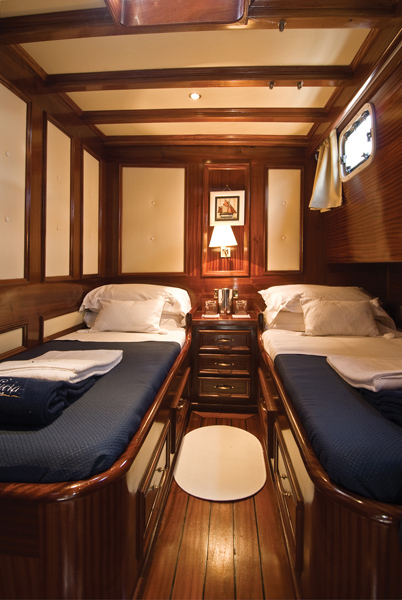 Further forward 2 double cabins are mirror image with a double bed each. 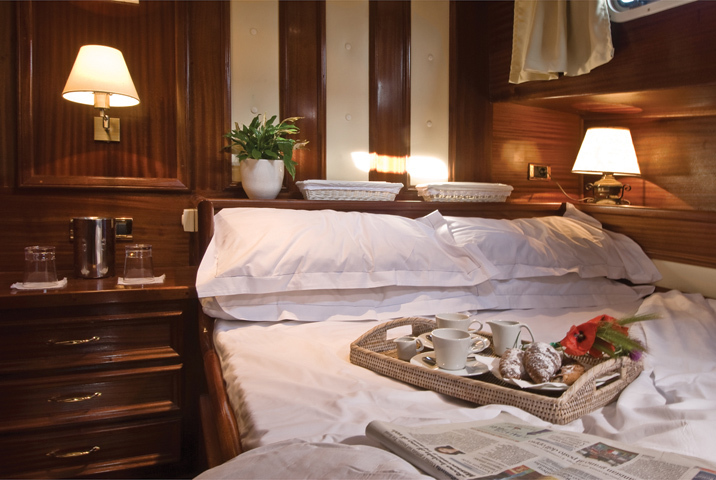 All 4 cabins are air-conditioned and offer TV/DVD and audio entertainment. 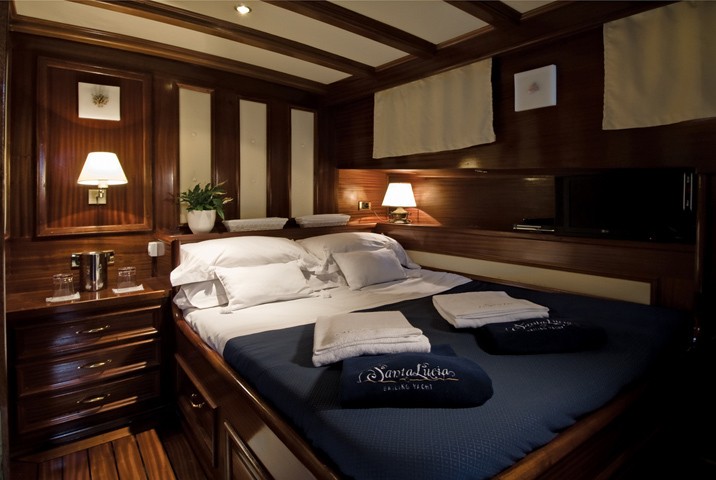 S/Y SANTA LUCIA offers a lovely warm traditional feel in her cabins, the fine mahogany follows through the yacht, nautical art and fine fittings create a serene ambiance. 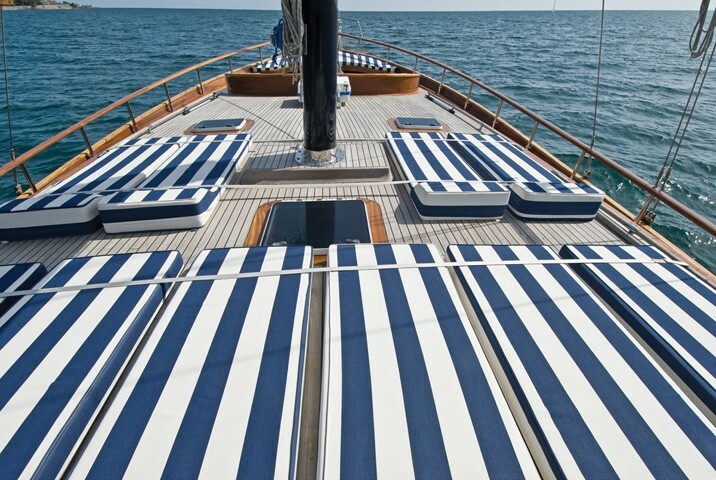 Tenders & Toys onboatd the SANTA LUCIA sail yacht include a Tender Joker boat 4.20 mt with outboard 40 hp. A tandem canoe and all equipment for water skiing and snorkeling.Windsurf. 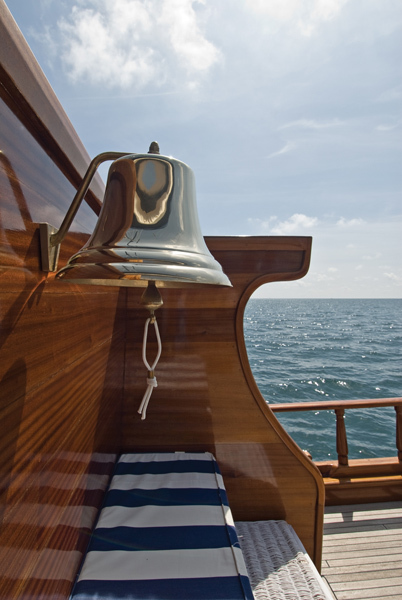 Communications include Epirb, GPS, Chartplotter,radar Raymarine, autopilot, log, VHF, eco. 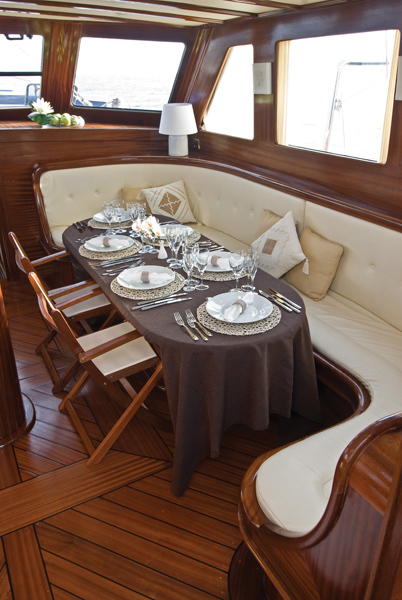 Audio Visual Equipment and Deck Facilities include SAT TV LCD, air conditioning, dvd/dvx/mp3 player.